Last month, a horrific attack on the Paris offices of satirical magazine Charlie Hebdo sparked new conversations about free expression among media and online activists around the world. 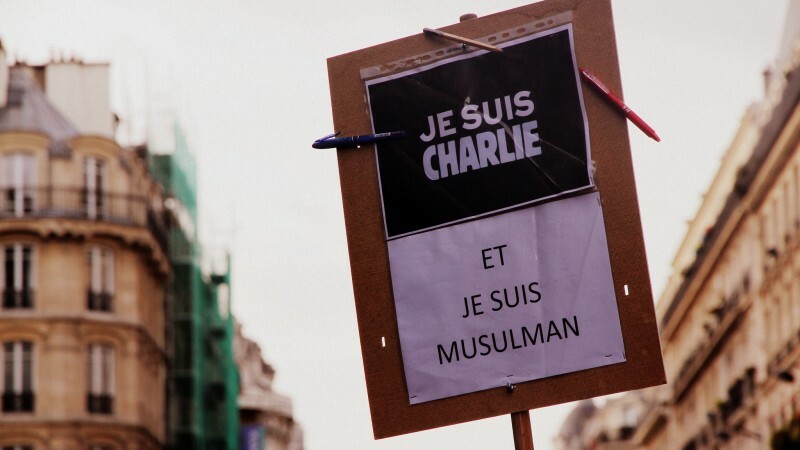 The reactions from writers across the Middle East and North Africa varied widely, from full solidarity with the Je suis Charlie campaign to skepticism of European attitudes toward free speech. On 11 January 2015, a court renewed detention of satire blogger Hussain Mahdi, known online as @Takrooz, who has been detained without trial since 15 June 2014. His lawyer claims that Mahdi has been tortured and forced to sign confessions on charges of insulting the Bahraini king, defaming several figures over Twitter and incitement against a group of citizens. Former opposition MP Sayed Jameel Kadhem was released from prison on 1 February after paying a fine. A court sentenced Kadhem on charges of ‘disturbing the elections’, in reference to a tweet he posted on 9 October 2014 stating that “the offers of political money reached up to 100 thousand BHD” for those who agreed to take part in the country’s previous election held in November 2014. On 20 January, prominent human rights defender Nabeel Rajab was sentenced to 6 months imprisonment and a fine of USD 530 on charges of insulting security institutions on Twitter. Rajab has been bailed and he is appealing the verdict. Activist Nader Abdulemam was released after spending nearly 6 months in prison for “publicly insulting a religious figure of worship” in relation to comments he had posted on Twitter. The tweets were deemed derogatory towards Khalid bin al-Waleed, a companion of the prophet Muhammad and a renowned Islamic commander. A court of appeal reduced Abdulemam’s initial jail sentence from 6 to 4 months and he was set free on 15 January. A website for the Bahraini Interior Ministry announced on 27 January the arrest of 9 individuals ‘for misusing social media’, a charge punishable by a up to two years in prison, under the kingdom’s penal code. On 4 January, the Egyptian interior ministry arrested two Facebook users for ‘inciting violence’ against the police and claiming responsibility for a number of ‘rioting acts’. The ministry also arrested a woman administering twenty-six Facebook pages and groups in support of Islamist ideologies and groups including the Muslim Brotherhood and ISIS. A student identified as Karim al-Banna was sentenced to three years in jail for announcing his atheism and insulting Islam on Facebook. Banna has been in jail since last November. According to his lawyer, the prison sentence could be suspended, if a bail of 1,000 Egyptian pounds (USD 140) is paid, until the court of appeals issues a new verdict in the case. In a resolution adopted on ‘the situation in Egypt’, the EU Parliament called on 15 January for an EU-wide ban on the export of surveillance technologies to the country. The resolution could prevent EU companies such as the UK based Gamma which had previously offered its Finfisher program to the Mubarak regime, from selling and exporting surveillance technologies to Egypt. Judge Abdel Satar Bayrakdar announced in a press release last week that Facebook will heretofore be considered a media platform, in which insult and libel will be punished by the law. Kuwaiti authorities jailed ex-minister Saad al-Ajmi over an online article alleging government corruption, published two years ago by the opposition Al-Aan electronic media. Al-Ajmi and the co-owner of the newsletter Zayed al-Zaid were both sentenced in absentia on 8 January to a week in prison. On 13 January, the Kuwaiti parliament voted in favour of stripping MP Abdul Hamid Dashti of his immunity for posting ‘offensive’ tweets against Bahrain. In late January, several online activists have been detained for “offending” the late Saudi King Abdullah. Activist Mohammed al-Ajmi was detained on 28 January for questioning over comments related to Saudi Arabia posted to Twitter, while at least four other activists have been arrested by state security over tweets deemed offensive to King Abdullah. Hisham Zayat, a Lebanese political activist and journalist for Yasour in the south of Lebanon was detained for a few hours and questioned on 8 February in the police station for expressing his thoughts on Facebook about the passing King of Saudi Arabia. Zayat was released immediately after questioning. Government critics in Oman routinely face harassment and detention, Human Rights Watch said on 19 December. According to the NGO, the authorities rely on a judicial arsenal that criminalize “illegal gatherings” and insulting the country’s ruler, Sultan Qabus bin Said Al Said, to crackdown on peaceful activists. The Telecommunications Regulatory Authority (TRA) approved nationals to register Omani domain names without owning a business. Omanis previously could not register a .om personal domain name, as the domain was restricted to businesses. The Palestinian Authority arrested and interrogated student Baraa Al Qadi for ‘lampooning’ top sports officials on Facebook. According to a report from the Palestinian Center for Development and Media Freedoms (MADA), this is not the first time Al Qadi has been detained and interrogated. His most recent arrest occurred on September 14th, during which he was detained for over two weeks. It is worth noting that MADA has reported an escalation in violations of freedom of expression in December. The organization has recorded an increase of violations committed by the PA against journalists and activists who voice their opposition to the government over social media. After condemning the attack against the French publication Charlie Hebdo, Saudi Arabia began lashings for blogger Raif Badawi for allegedly ‘insulting Islam’. Last May, he was sentenced to 10 years in prison and 1,000 lashes for criticizing his country’s powerful clerics and religious authorities on the Liberal Saudi Network, a blog he founded. Badawi is scheduled to receive 50 lashes each Friday over a period of 20 weeks. The kingdom’s Supreme Court is set to review the flogging punishment against the blogger. On 12 January, a criminal court in the capital Riyadh sentenced Badawi’s lawyer Waleed Abu Al-Khair to 15 years in prison. Al-Khair had previously been sentenced to serve 10 years in prison, and to an additional 5 year suspended jail term. Founder of the Monitor of Human Rights in Saudi Arabia, Al-Khair faced what the Gulf Center for Human Rights has called ‘multiple trumped up charges’ including ‘antagonizing international organisations against the kingdom’, ‘incitement of public opinion against authorities’ and ‘setting up and supervising an unlicensed association’. Women’s rights activist Souad al-Shammari—who co-founded with Badawi the Saudi Liberal Network—was released on 29 January after spending three months in jail. Shammari had been detained without charge since 28 October 2014 over tweets mocking religious figures. Twitter users in Saudi Arabia will now have to be careful what they retweet. According to one legal consultant, retweeting abusive or offensive tweets is subject to the same punishment as the original posters under the country’s anti-cybercrime law. Saudi media reported that a man who filmed and published on the web a video showing the gruesome beheading of a woman convicted of murder had been arrested and would be prosecuted under the country’s anti-cybercrime laws. Sudan has adopted an access to information law, but local journalists are concerned that the law may be used against them in a country that has a long history with press freedom violations. “Theoretically, the draft law is a good step,” blogger Usamah Mohamed told SMEX. “At the practical level, it is not going to lead to any progress with the current strict restrictions on freedom of expression and the press,” he added. On 20 January a military court sentenced blogger Yassine Ayari to one year in jail on charges of ‘defaming the military’ through a series of Facebook posts in which he criticized the Minister of Defense Ghazi Jeribi and the counter-terrorism failures of the military institution. Living between Tunisia and France, Ayari had initially been sentenced in absentia to three years in jail. He was arrested on 24 December upon his arrival at Carthage International Airport in Tunis. Both Human Rights Watch and Amnesty International condemned his imprisonment. The UAE has blocked the website of the Gulf Center for Human Rights (GCHR), a non-government group working to support human rights defenders in the Gulf region. Egyptian women resort to social networking sites to expose harassers. Collective Tunisian blog Nawaat interviews ‘Fallaga,’ a group of Islamist hackers. Global Voices’ Afef Abrougui explains how governments in the Arab Region make use of apostasy and blasphemy accusations to crackdown on political dissent. SMEX asks: Is Iraq restricting speech on Facebook? Check out reflections from the Global Voices Summit in Cebu, 24-25 March. Twitter transparency report: Can it hold Arab government to account? OpenITP: Open Circumvention Tech Festival 1-6 March. The Vox-Pol network is hosting a workshop on the role of internet companies in responding to violent online extremism at the Central European University on 5-6 March. The International Journalism Festival will take place in Perugia, Italy, from 15-19 April. Digital Citizen is brought to you by Advox, Access, EFF, Social Media Exchange, and 7iber.com. This month’s report was researched, edited, and written by Afef Abrougui, Hamza Ben Mehrez, Ellery Roberts Biddle, Jessica Dheere, @freedomprayers, Abir Ghattas, Mohamad Najem, Dalia Othman, Courtney Radsch, and Jillian C. York and translated into Arabic by Mohamed ElGohary.